So you can take the benefits of the support our ergonomic chairs provide with you anywhere you go, we developed our innovative back cushions that adjust to fit your own back shape but are lightweight and easily transportable. 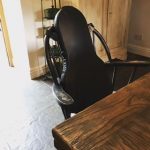 Extra back support for dining chairs and office chairs, so whether you are home working from your kitchen table or from the office, you can get a quick and easy solution that will work. Lower back support cushion providing relief from back pain on the train.